Lorne Matalon, the Fronteras Desk correspondent for Texas based at Marfa Public Radio and West Texas Public Radio, has been selected as the next Energy Journalism Fellow at the University of Texas at Austin for 2016-2017. Matalon was awarded the fellowship opportunity by UT’s Energy Institute and the Kay Bailey Hutchinson Center for Energy, Law and Business, the interdisciplinary academic center created by the School of Law and the McCombs School of Business at the University of Texas at Austin. In 2014, Mexico formally changed its constitution to allow foreign companies to participate in Mexico’s domestic oil and natural gas markets. Matalon’s fellowship research will focus on the challenge and opportunity for U.S. energy and energy-related businesses implied by energy reform in Mexico. 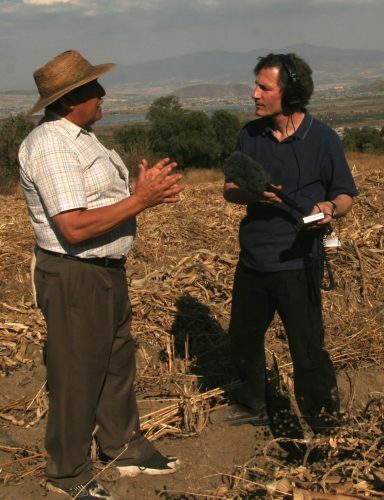 Matalon is a 2016 winner of a National Edward R. Murrow Award for Investigative Reporting for a series on land displacement and violence along the path of proposed pipelines and other energy-related infrastructure in the Juárez Valley, which hugs the U.S. border near Juárez, Mexico. He succeeds the 2015-2016 Energy Journalism Fellow Russell Gold, senior energy reporter at the Wall Street Journal. Matalon will continue to file radio stories for Marfa Public Radio and West Texas Public Radio throughout the fellowship. This entry was posted in KRTS Spotlight and tagged Border Issues, Economics, Energy, Fronteras Desk, journalism, Mexican Energy Reform, Mexico, University of Texas, UT Energy Institute. Bookmark the permalink.